In Byzantium Book Five: SHATTERED BONDS, we learn the fates of the travelers beset by civil war, undead hordes, mage mysteries, treasure-driven treacheries and violent siege, and review the exploits of Kirkgrim the Wanderer, Lady Mirabelle de Castile, Sigroth Sigrothson, Fitz the Guide, and Fred the fighting truffle-pig, those who survived...and those who did not. 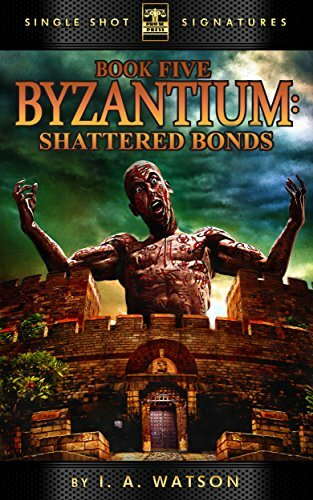 With a haunting cover and logo design by Jeffrey Hayes and logo design and digital formatting by Antonino lo Iacono and Marzia Marina, BYZANTIUM BOOK FIVE: SHATTERED BONDS is available now at Amazon at https://www.amazon.com/dp/B07FZ65ZS3/ref=sr_1_1?s=books&ie=UTF8&qid=1532794773&sr=1-1&keywords=byzantium+shattered+bonds for only 99 cents. Kindle Unlimited Members can read for free.